Rains have arrived with style in Mumbai. While some of us enjoy indoors with books & coffee, it is fun to go out for a lot many. Don’t we all look out for a nice place that we and our family can spend together and have fun? Let us help you with one. 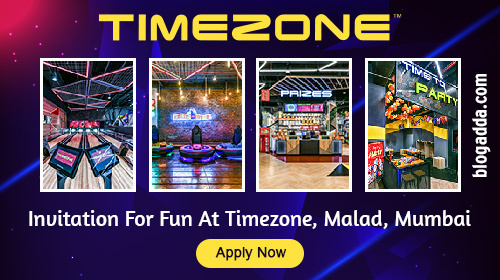 Timezone Malad – The leading family entertainment centre known for its high octane interactive arcade games for families and kids. Timezone is your one-stop interactive entertainment destination having latest arcade games, exciting rides and fabulous prizes to win. It lets you re-live your childhood and make new memories with your family and friends. Timezone has recently revamped and relaunched itself as #NEXTGENTIMEZONE at Inorbit Mall, Malad in Mumbai. It is all set to lure kids and families with lot of new exciting games, irresistible offers and promises a fun filled time. BlogAdda and Timezone brings you a wonderful opportunity to visit the centre in Malad with your family and children to experience varied concepts and games that have made its debut for the first time in India. If you’ve been to Timezone earlier, this is unlike the older one. They’ve completely changed for good. The change is reflected in the store layout and designs, from a playful and colorful store background that enticed only kids earlier, Timezone has moved to more urbane and futuristic design and colour palette that makes it an ideal destination for family entertainment. A few of the unique concepts and games include Krazee Whirl Cars, Virtual Rabbids, Willy Wonka Chocolate Factory and Family Bowling. They even have a bigger and exclusive Prize room with extensive variety of merchandise available for you and children to choose from. You can visit the centre and experience the same with your partner and kids and we are sure it will be a memorable day/evening with fun family time together. We have limited seats. If you are interested, stay in Mumbai do apply now! Selected bloggers will visit the centre and share their experience via blogpost and on social networks. Timezone is present in 7 countries and currently has 26 stores in India located within all the leading malls like Inorbit Malls, Korum Mall, Phoenix Market City and is expected to open a total of 32 stores by end of 2018.